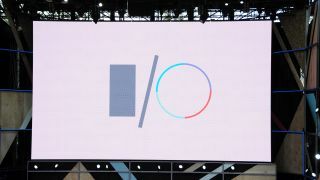 Update: The Google IO liveblog keynote is being updated continually as the two-hour press conference rolls on. Here's the latest news in real-time. 11:55 AM: That's it! The Google IO liveblog is a wrap. The connection stayed strong and the seats were comfortable, a rarity for liveblogging at tech events! I'm glad I could keep you updated instead of fumbling with Wi-Fi every other minute. The only issue was that the sun is now out and shining behind the Shoreline Ampitheater's half-roof. Pasty geeks are about to get fried! Please check out techradar for all of the news and hands on review content by my colleagues. There's a lot of reading between the lines we're doing about what Google had said on stage and what it mean for you down the line, from Android updates to deep learning. 11:50 AM: Sundar is back on stage talking about deep learning and machine learning, and focusing on advancements like curing diseases. Google wants to see the power of machine learning to help people who are doctors and educators. The vision is to solve problems like climate change and health care. 11:45 AM: Google is announcing Instant Apps, which will runs apps without any installation needed. it'll be compatible all the way back to Android Jelly Bean. "It's a big change in how to think about apps," so it'll be available later this year for users. 11:42 AM: Firebase will be available today at 2 PM, about two hours after the Google IO keynote ends. 11:38 AM: If you use Google Analytics, you'll love the new updates coming to the stats platform. It's being built for apps, includes cross-network attribution and integrated across Firebase, a small company that Google bought recently. There are a dozen other features, too. Best of all, it's all completely free and unlimited. 11:34 AM: This one is for the professional Android developers in the Google IO audience. Google is making web development through Android Studio smarter and faster, going as far as writing some of the code. Basically everything at this keynote is about predictive shortcuts to everyday tasks. It's enhanced C++ support with additional build systems, and it's letting devs download and try it today, asking for feedback. 11:30 AM: Google is now shifting to Chrome with over 1 billion active users every month, and its touting its accelerated mobile pages, saying these pages load almost instantly. It's making it easier to develop mobile websites, which is good news for both developers and end-users. 11:25 AM: Fitness is going to be improved with fitness metrics being calculated without your phone nearby and better support for third-party for health apps, including Strava. 11:24 AM: There's more happening on the Watch face, with messaging and fitness and new features like Smart Reply, handwriting and even a keyboard for Android Wear. That's last one is going to be great for noisy bars and events in which you can't clearly speak into a watch, but want to message someone. 11:22 AM: Android Wear is entering its third year, and it's going to offer better experiences with Android Wear 2.0, Google announced at its Google IO keynote just now. Hopefully it's able to excite us more about the smartwatch category. 11:20 AM: Game companies are obviously ready for Daydream, including top names like Ubisoft, CCP and EA Google Play Movies in a virtual movie theater. It promises more at 9AM tomorrow at Google IO. It's left us with a lot of questions. 11:18 AM: News through Daydram VR can be had through sources like the New York Times, Wall Street Journal, CNN, while video streaming services like Hulu, Netflix and even IMAX will support it. 11:17 AM: The Google IO keynote is demoing a small remote-like Daydream controller. It's simple and motion controlled, sort of like the Wii remote, but even tinier (read; easier to lose).